I will tell you the story of how he received it, which is found in the very well-known book “De Dignitate Psalterii” by Blessed Alan de la Roche. 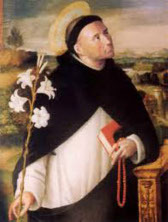 Saint Dominic, seeing that the gravity of people’s sins was hindering the conversion of the Albigensians, withdrew into a forest near Toulouse where he prayed unceasingly for three days and three nights. During this time he did nothing but weep and do harsh penances in order to appease the anger of Almighty God. He used his discipline so much that his body was lacerated, and finally he fell into a coma. At the very beginning of his sermon an appalling storm broke, out, the earth shook, the sun was darkened, and there was so much thunder and lightning that all were very much afraid. Even greater was their fear when looking at a picture of Our Lady exposed in a prominent place they saw her raise her arms to heaven three times to call down God’s vengeance upon them if they failed to be converted, to amend their lives, and seek the protection of the Holy Mother of God. God wished, by means of these supernatural phenomena, to spread the new devotion of the Holy Rosary and to make it more widely known. At last, at the prayer of Saint Dominic, the storm came to an end, and he went on preaching. So fervently and compellingly did he explain the importance and value of the Holy Rosary that almost all the people of Toulouse embraced it and renounced their false beliefs. In a very short time a great improvement was seen in the town; people began leading Christian lives and gave up their former bad habits.